Is Gmail down? Did Chrome crash? Yes, and the whole world is panicking. Yes, Gmail is down right now. Update, Monday, Dec. 10, 1:20 p.m.: Our short national nightmare appears to be over. As of 1 p.m., Google reports that both Gmail and Google Drive should be working again. No word yet on what brought the services to their knees, but I’ll keep you updated. Meanwhile, you can check their status on Google’s Apps Status Dashboard. Original post: Businesses shuttered their doors, planes fell from the sky, and life as we know it screeched to a halt Monday morning as Google’s ubiquitous email client and browser went down. Actually I have no idea if those things happened, because I can’t check my Gmail or open Chrome to find out. OK, so it wasn’t actually the end of the world. Still, an apparently widespread outage of some of Google’s most popular services sent desk workers worldwide to the dustbins of their “applications” folders for alternatives like Microsoft Outlook, Firefox, and even, in the most desperate cases, Internet Explorer. 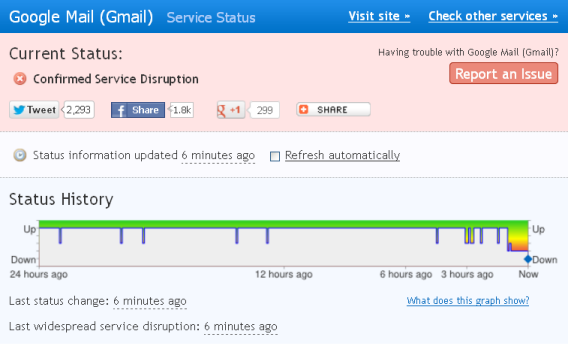 According to the website downrightnow.com, reports of an outage began shortly before noon eastern and were ongoing as of 12:35 p.m. For some reason, Google’s PR folks have not yet responded to my email asking for an explanation, but I will update when they do. Until then, recall that The Onion predicted this, and enjoy some choice reactions from the Twitterverse.